Microsoft's November update is rolling out now. Here are three tips to help take advantage of the switch and watch out for one minor annoyance. Microsoft recently released its anticipated Windows 10 November update that included new messaging apps and some small tweaks to the Windows experience. If you haven’t received the update yet you will soon. Unlike other updates, this one is a big enough overhaul that you go through a similar process to the original Windows 10 install. Once that’s done, you won’t have a fundamentally new Windows 10 experience—just a slightly improved version of what you’ve already got. You can read about the big tweaks from our earlier November update write-up, but here are three smaller things you might not have heard about. After the Windows 10 update, some of your default programs may have reverted back to the original Windows defaults. All my video files, for example, were set to play with the Windows 10 Movies & TV app instead of my preference, VLC. We’ve already covered how to change Windows 10’s default apps so I won’t go over that here. Just know that you may have to put things back the way you like them. 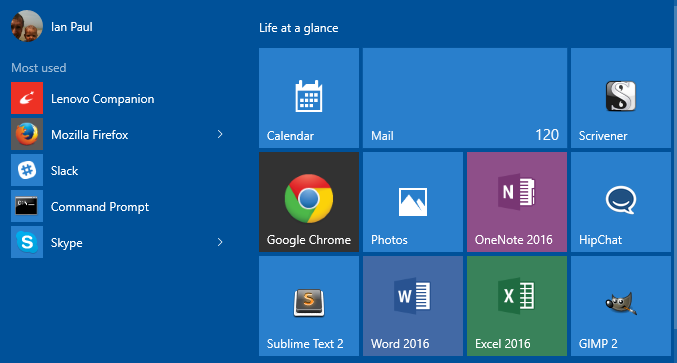 Windows 10’s Start menu with four tiles across. By default, each section on the right side of your Start menu on Windows 10 has enough room for three app tiles (or one medium-sized one and one wide one). If you just can’t get enough of Windows 10’s live tile action you can expand it to four across per section. To do this go to Start > Settings > Personalization > Start and turn on Show more tiles. Microsoft’s Windows 10 logo screen was nice to look at during the build-up to the operating system’s release. But I don’t need to look at it every day. The November update lets you change this by going to Start > Settings > Personalization > Lock Screen. Next, scroll down a little bit and turn off the slider labeled “Show Windows background picture on the sign-in screen.” Once that’s done you’ll get a plain login screen with no background image instead of the Windows wallpaper image. If you can’t wait for the new Windows 10 update, you should be able to get it by downloading Microsoft’s media creation tool and doing an in-place install. And for more secrets and handy features, be sure to read PCWorld's guide to Windows 10's best tips, tricks, and tweaks.